This game is modeled after "Spoons" where all you need is a deck of cards and spoons. But, this version uses conjugations of regular, present tense verbs in place of the standard Ace to King cards. I bought a box of plastic spoons to use in class. Once students are in groups to play, the group will need one fewer spoon than there are students in the group. So if I have a group of 5 students, that group will need 4 spoons. I printed and cut out the cards in the attached PDF file. I then used clear packaging tape to put them on the front of actual playing cards. I did this for several reasons, 1) you cannot see through the cards that way, 2) they are much more sturdy for passing during play, and 3) believe it or not the students seem to like the game more when they get to use "real" cards rather than laminated paper. All that said, you can just print the cards on a thicker cardstock, cut and laminate if you'd rather not spend the time or money dealing with a real deck. To Play: Shuffle the cards. Each player is dealt 4 cards to start with and the rest of the stack is placed face down with the person who will start that round. The spoons are lined up in the center of the game play area (one less than people playing). When the game starts, the first person picks up the first card and looks at it. S/He decides if they will switch it out for one in their hand or pass it upside down along the table to the next person. If they make a switch, they will discard one face down along the table instead. The last person to get the cards will still discard to a pile next to the dealer (this may be drawn from if the original stack is used). You can have no more than 4 cards in your hand at a time. 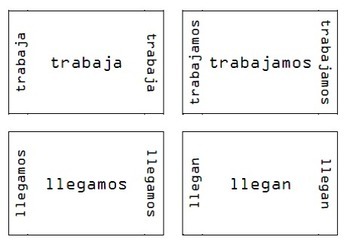 The goal is for students to gather 4 cards that are conjugations of the same verb. Game play continues in this fashion until someone gets a complete set. 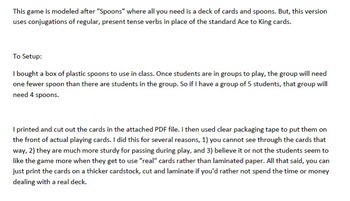 Once a set is obtained, that student will grab for a spoon at which time everyone playing should also go for spoons. The person who doesn't get a spoon that round will get a letter. Players are eliminated as they spell the word. I like to play "Verbo" with my students because there are enough letter that rarely do people get eliminated thus, more practice for students! The verbs used in the game are any of the six present tense conjugations of: cambiar, caminar, estudiar, llegar, llevar, necesitar, planchar, trabajar, beber, comer, leer, escribir, and vivir. I also have included the original Word file so you can change the verbs and/or tenses as necessary if you want.